On June 5th, 2015, I was diagnosed with Stage IV esophageal cancer. This is all about my fucked up, involuntary journey into the cancer ward, and the odd joys that arise even there. So, I'm happy and humbled to announce that my book launch was a resounding success, in the being-surrounded-by-lovely people sense. It's a privilege to be among so many friends and writers whose work I admire. To those who could make it, thanks so much for being there. I wish I'd had more time to spend with each of you. To those who could not make it, happy thanksgiving, my dears! I'll be seeing you soon. 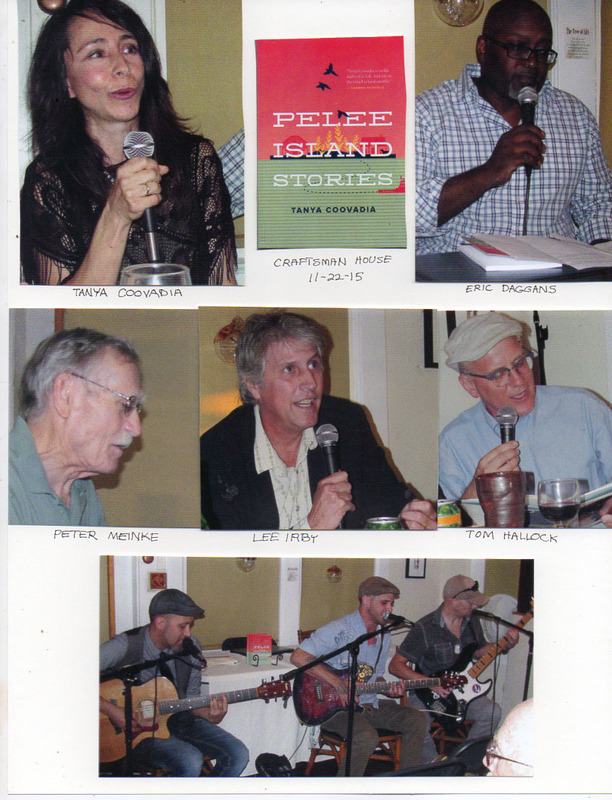 We'd planned to video this speech, because I really wanted to thank people who were instrumental in the creation of Pelee Island Stories, but were unable to be there. Unfortunately, someone forgot to hit record. So I've included the text of my speech below. I'd also promised to share the entire text of Swimming Lessons, the short story from which I read a tiny excerpt. It is here. Photo credit: The lovely Jeanne Meinke. "Hi everyone. Thanks for coming. First of all, I have to assign some blame: This is all Adam’s fault. My husband, Adam Coovadia, made me do this. Because, let’s face it, the writer in the room is the last person to be throwing the party. More often, she's the one sitting in a corner, quietly writing down your conversation. But Adam says art is communication, and that, unless you share your work, it doesn't fully exist. So here we all are. Thanks Adam! And thanks to Jeff Schorr, proprietor of the amazing Craftsman House Gallery, for offering up this lovely space. I'd be remiss if I failed to acknowledge the tall, hooded, scythe-wielding elephant in the room. I have terminal cancer. It's a daily fact in my family's life. It's also the reason we're here today, too early, in my opinion, in my career as a writer. But the fact is, I simply don't have a lot of time. And the truth is, none of us do. As Adam says, we're all dying. I'm just doing it a little faster than the rest of you. So I've asked my friends who share this podium to talk about death, if they're comfortable doing so. I encourage all of you to do the same. Death is inevitable, after all. Ignoring it does not make it go away. Or we'd all live forever. I have so many people to thank, we'd be here forever if I got to them all. Hilary Flower, for example, has been an incredible reader and editor and all-round doula of my work. Dee Gill has been listening to me go on for years about a novel that now resides in a drawer. David Pinto has been an insightful, careful reader of that same novel. Sterling Watson, who sent Peter Mienke in his stead today, has been my valued mentor for years, first at Writers in Paradise, then at Pine Manor College’s Solstice program, where he helped me put together a critical thesis to be proud of. I owe all of these people a lifetime of thanks. And I have to thank all of you here today, for coming. Thank you very much. Except for you mom--attendance is pretty much mandatory for you. So now I really have to talk about how this little book came about. In many group writing situations—an oxymoron if there ever was one—there's this underlying rivalry. A quiet tension that goads you into engaging in what amounts to competitive writing. I think it's because the publishing industry is so capricious (and financially unrewarding) and lately, ineffectual, that writers seem increasingly beside the point. We're all gamely battering ourselves against the industry's walls. Meanwhile, the industry churns out "50 Shades of Dating Your Predator" as though it's actual literature. It’s true that, historically, the publishing industry's primary role has been to prevent people from publishing. And, honestly, that's been an important job. There's a reason we're all suspicious of self publishing. A lot of self-published work—probably the majority of it—is pure, uncurated, dreck. Publishing's traditional, primary purpose was to serve as a sort of dreck filter. And yet we’re wading through 50 shades of it. Anyway, I was talking about competitive writing, and how writers, not the most socialized people to begin with, oftentimes end up viewing each other as rivals. But the Solstice program, where I did my MFA, works toward the opposite goal. Director Meg Kearney has managed to create a freakishly supportive community of writers. Her regular admonishment, throughout the program, is to fall in love with another student’s work. And in a place where everyone is working toward honing his and her craft, there’s a lot to choose from. Jane Cawthorne, a brilliant writer and established Canadian playright, chose to fall in love with my stories. As for her work, I was completely smitten. She’s writing this gorgeous novel. It’s artful and poignant and meaningful. And entertaining. I mean, Jane herself is a rock star. She’s the kind of person who writes a very successful play, entitled the Abortion Monologues, and bravely weathers years of crazies. She’s the type of person who survives Hodgkins Lymphoma to take up mountaineering. In her fifties. She’s also the type of person who would gravitate toward a talented writers collective. And now we come to my not-so-secret agenda. Because, as the profit model fails publishing, as the dreck filter fails to differentiate the dreck, as we all move forward in a world where any artistic endeavor that can be digitalized is considered free for the taking, what remains is the work. And other writers. We can curate each other’s work, and we should. I think we have a responsibility to do so. Because look what can come of it. This little book, published by the almost prescient writers, editors and designers of the Crabapple Mews Collective, turned out exactly as it should. In one of my stories, an old man describes the ungainly beauty of pheasants in flight. And here they are, right on the cover. My stories may not be for you--they’re not for everyone--but they are the best possible versions of themselves, because they were curated by a group of people who truly care about the work. So go forth and form collectives! Okay. Bossy lecture aimed at the writers in the room is officially over. The stories in this book are set on a small Island in the middle of Lake Erie. I’ve asked my fellow readers to talk about Islands... or Florida, which is Island-like in that it’s surrounded on three sides by water--or Death, which is, let’s face it, an underlying theme of today’s event. Thomas Hallock is one of the few professors I’ve met who takes academic writing into the realm of poetry. As a specialist of Florida literature, his interests often lie at the juncture of ecology and literature. His books have titles such as “Early Modern Ecostudies: From the Florentine Codex to Shakespeare” and “From the Fallen Tree: Frontier Narratives, Environmental Politics, and the Roots of a National Pastoral.” Weighty titles, but we often think of academics as writing in some dead language or another. Tom Hallock brings language to life. For many, the next reader is a man who needs no introduction. Eric Deggans is probably the coolest guy I know. And as NPR’s TV critic, he has the coolest job on the planet. He gets advance copies of Fargo--how cool is that? But Eric is not content to simply entertain us with observations on the current state of entertainment--even on the most erudite platform available. For years, he's been making some very important observations about race, and how it's portrayed—and used for the purpose of manipulation—by society's warped mirror: the media. His book “Race Baiter” is a primer for this most important of topics. Which is the coolest thing of all. My next guest, here at the behest of my mentor Sterling Watson, is a St. Petersburg institution. The current Poet Laureate of Florida, Peter Meinke has lived in St. Pete since 1966. He was an important member of the Eckerd College faculty for almost three decades, and produced many works over his long career; beautiful books of poetry and non-fiction and short stories. Really wonderful short stories, by the way. I especially loved the "Piano Tuner." Thanks very much for coming, Peter." and for this sweet story in the Gulfport Gabber. Glad to hear the launch went so well. Keep on writing and fighting the good fight. I'm praying for you and holding you in the light. Take care! Thanks so much, Chuck. So sorry I hadn't seen this sooner. I'll take those prayers. Something seems to be working. Thanks for your light.